Honda CB250 Nighthawk was really 'just a motorcycle' under a bit too much plastic. The subject of this blog is Royal Enfields, but under discussion today is a Honda motorcycle that seems to share much with the Royal Enfield Bullet. It is relatively unadorned, stops with drum brakes, delivers terrific gas mileage, is just barely fast enough for American roads and has a bargain price. Unlike the Royal Enfield Bullet, however, the Honda CB250 Nighthawk may drop out of the American market this year. It is not in the company's announced model line-up for 2009. Contrast this with the fact that, Tuesday, at the INTERMOT convention in Cologne, Germany, Royal Enfield unveiled a new Bullet that shares its heritage and look with Royal Enfields of the past. The Nighthawk's departure would leave Honda with cruisers, sport bikes, off-road bikes and everything in between, but nothing that looks like "just a motorcycle." The whining began immediately on the Yahoo message board devoted to the Nighthawk. Would Honda replace it with a motorcycle that offered a navigation system? Why not a baby monitor? How about an on-board espresso maker? Honda does seem to be losing sight of what the Royal Enfield Bullet epitomizes in the world market. 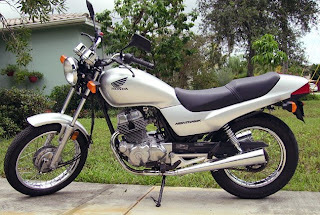 As one person put it: "At the end of the day it is meant to be a simple, economical, beautiful and practical bike-- all that you need in a motorcycle -- and nothing more." Nighthawk fans have been in fear for years that their favorite mount would be orphaned. This is a design that has had a 20-year run. Most Americans encounter it as the motorcycle they learn on in their Motorcycle Safety Foundation training course. That's where I first rode a Nighthawk. When my beloved Bullet went into the shop for an extended time I bought a Nighthawk of my own to get to work. I enjoyed the simplicity it shared with the Bullet. I missed the kick start (although you can clearly see the embossed circle on Nighthawk transmission where it belongs). I also missed the center stand and, forgive me, the neutral finder of the four-speed Bullet. You can buy an aftermarket center stand for the Nighthawk, but the glory of the neutral finder is apparently a lesson only Albion learned. My Bullet is back and so my Nighthawk is up for sale. Should I ever need another motorcycle it's good to know that Royal Enfield continues to produce what is needed -- and nothing more. Too bad for Honda. Check out the TU250 coming to America from Suzuki for '09. It has a refined motor, single exhaust port, 30" seat, 20HP, fuel injection, and a standard seating position. The Suzuki website has it available to view. Thank you for the tip. I will take a look. All best.